A chief from east Molokaʻi and a few of his people boarded canoes and set off around the island. They found themselves on the southwest coast of Molokaʻi. They paddled up to some fishermen who had a large catch of opelu. Hungry, they began to eat. As they were all eating with great satisfaction, another group of fishermen came by and cried: “Stop. Do not eat the opelu. This is the season of opelu kapu.” However, the visiting chief only had a kapu for eating turtle, so they continued eating. The fishermen attacked the visiting chief and his men. Overpowered, they were brought before the kahuna. The visiting chief became very ill, and the only way to make things right was a human sacrifice to save the chief from death. One of his men offered himself as a sacrifice and the chief recovered. The kahuna ordered a tree planted on the grave of the willing victim. The grave was on shore; when the tide was high, the waves would wash sand from the grave. Thus, in a very short time, the body would be exposed. Today, the sandy beach is seen as the primary feature here (it’s over 2-miles long and 300-feet wide, the largest on the island and one of the largest in the Islands.) It lies between two headlands, Puʻu Koaʻe to the south and Puʻu o Kaiaka to the north. The sand caught people’s attention. First, folks looked to replenish eroding beaches by harvesting sand from one area and filled in at another (primarily at Waikīkī.) Reports from the 1920s and 1930s reveal that sand was brought to Waikīkī Beach, via ship and barge, from Manhattan Beach, California. As the Manhattan Beach community was developing, it found that excess sand in the beach dunes and it was getting in the way of development there. At the same time, folks in Hawai‘i were in need for sand to cover the rock and coral beach at Waikīkī. 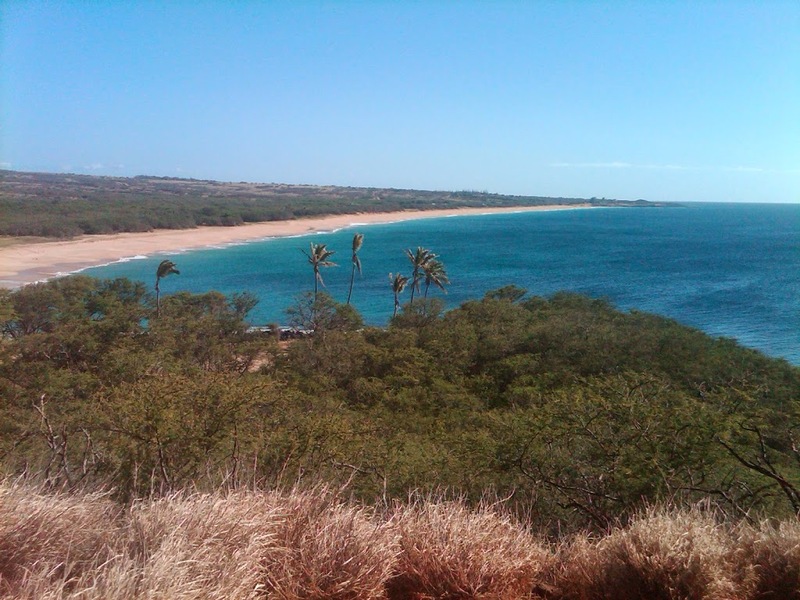 Later, Waikīkī’s sand was trucked from various points around Hawai‘i including O‘ahu’s North Shore – in particular, Waimea Bay Beach, a sand bar off the town of Kahuku and Pāpōhaku Beach on Moloka‘i. Reportedly, before sand mining operations removed over 200,000 tons of sand at Waimea Bay to fill beaches in Waikīkī and elsewhere, there was so much sand that if you would have tried to jump off Pōhaku Lele, Jump Rock, you would have jumped about six feet down into the sand below. Then came statehood, and the building boom of the following decades. In the 1950s, a harbor was dredged and a wharf constructed at Hale O Lono by B&C (Brown and Clewitt) Trucking to ship out sand from Pāpōhaku (B&C also owned Seaside Inn and Pau Hana Inn.) A 1957 contract between Molokaʻi Ranch and HC&D allowed for sand to be removed from a 297-acre southern parcel of Pāpōhaku Beach. “All day long, every day, had trucks going back and forth from Pāpōhaku to Hale O Lono.” From the early 1960s to 1975, this massive cache of sand was the site of the largest sand-mining operation in the state. Some of the sand was drawn from below the high water mark, which was public land and required a government permit; at times the dredge bucket even drew the sand out of the ocean. This was not legal and HC&D was caught and reportedly fined, resulting in a million-dollar settlement. In lieu of payment of the fine, reportedly, Molokaʻi Ranch gave the land at Ala Mālama in Kaunakakai. Even with the decades of sand removal, Pāpōhaku Beach remains one of the longest white sand beaches, and the Pāpōhaku Dune system associated with the beach is among the largest in Islands. Pāpōhaku Dune (like other sand dunes) is the first and last line of defense against coastal erosion and episodic high waves for the existing structures located behind it. Recently, the UH-Mānoa, Department of Urban and Regional Spring 2005 Graduate Practicum class prepared the Pāpōhaku Dunes Cultural and Natural Resource Preservation Plan. DLNR is looking for ways to protect and enhance the Pāpōhaku Dune’s long-term sustainability.